check in their vehicles with the END of TRAIL Administration Office and get a Founders Ranch Permit, which will authorize the use of the vehicle at Founders Ranch. Golf Carts, ATVs, and single seat carts will be allowed on the Range Road and in designated parking lots on the west (near the bridge) and south of town. Golf carts or ATVs may only be parked along the fence line (grassy area) on the range road. They may not be parked in the road, in bays, or the mouth of bays, behind vendor buildings, or in front or around the Copper Queen/Belle Union. Even with permits, golf carts and ATV’s are not permitted in town and may not be parked in town. Only single seat handicap vehicles are allowed in town. SASS will still provide handicap parking for vehicles with proper handicapped identification. Powered gun carts are permitted as long as they are not drivable vehicles. This will allow handicap shooters to drive within a short distance of almost every place in town and still keep town as dust free as possible. Another change is the pet policy. The pet policy at END of TRAIL has never been very clear. This year pets are allowed in town at END of TRAIL, but are not allowed in the Belle Union, Gem Saloon, or Copper Queen. Vendor buildings or tents are off limits as well unless the vendor invites your pet in. Pets must be on a leash, and you are responsible for your pet and cleaning up after your pet at all times. There will be the public at our event, so if your pet does not like crowds, do not bring them into town. Pets may stay in the campground in campers as long as they do not bother other campers. Camping, with the exception of Founders Club Camping, is on a first come first served basis. We always seem to have some campers believe the rules don’t apply to them and some even try to get in and not pay for camping at all. This year camping paid for in advance is the normal $50 dollars for the event. If you wait and pay for camping when you get to the ranch, it will be $75. You are not allowed to set up unless you have a camping permit on your camper and auto. Founders Club members that will be camping need to register for camping before June 1st to make sure your spot is not used for another Founders Club Member. Remember, we have more Founders Club Members than we have reserved camping spots on the first four rows. arena into a full-fledged mounted arena in the next few years, so the mounted events are more visible to all of our members. One last thing before I sign-off, by the time you read this article, a new END of TRAIL website will be up and running. 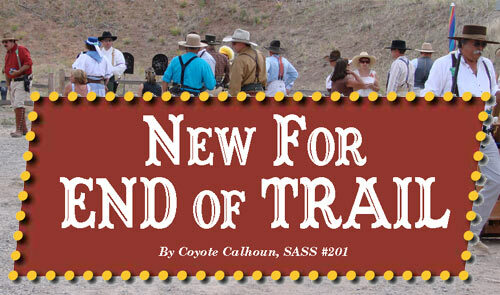 Just click here: http://www.sassnet.com/ENDof TRAIL/index.php.